The daily caller has a very good summary of some of the more controversial decisions of Justice John Paul Stevens. The retirement announcement by Supreme Court Justice John Paul Stevens brings about the usual speculation about his replacement, as well as the retrospective of the retiring justice’s career. Much will be made of the oft-described collegiality of Justice Stevens, and deservedly so. He is by all accounts a decent man, a World War II veteran, and he is beyond question a Justice who wrote opinions across the spectrums of ideology and judicial philosophy, notably defending, in dissent, Congressional action to ban the desecration of the United States flag (see Texas v. Johnson, 491 U. S. 397). But make no mistake about Stevens’ legacy. He is, like virtually all modern liberal jurists, an activist who is not afraid to use the Court to achieve his own philosophical ends. And that tendency is as dangerous as a renegade president and Congress hell bent on increasing the power of the state at the expense of liberty, as is the case with the current regime. Justice Stevens’ opinions span some 34 years, seven Presidents and numerous colleagues on the Court. Accordingly, some will point to supposedly “right leaning” decisions from yesteryear, such as the aforementioned flag case, his 1978 opinions upholding an FCC regulation against broadcasting indecent material (see FCC v. Pacifica, 438 U.S. 726) and voting to strike down a racial quota system in California (see Regents of University of California v Bakke, 438 U.S. 265), as well as his 1976 opinion voting to reinstate the death penalty (Gregg v. Georgia, 428 U. S. 153). Now why do I consider the man to be a party hack? I have been reading through the considerable amount of material that is the opinion of the SCOTUS in the Citizens United case. This was a case which essentially touches on freedom of speech for those who have banded together in a group in order to promote their political views. The majority decision in the Citizens United case has struck down the restrictions on corporate funding for political campaigns which in effect has denied a group of citizens the right to free speech. The majority made their decision in part to strike down the offending clause because of the penalties attached. The power given to the FEC does indeed "chill" free speech to a certain degree, which is the point that was being made by the majority. Having read through the well-reasoned majority opinions, it was like getting a dash of cold water to read the meanderings of the Stevens opinion. The anti-corporate stand of Justice Stevens seems to me to be a little bit over the top. My first impression when I started to read what he was saying was "party hack". The tenure of Justice Stevens on the Supreme Court has seen a number of decisions that have weakened the intent of the founding fathers, especially in his interpretation of the Commerce clause (yes I do believe that those interpretations that have broadened the Commerce clause are in fact wrong). He has also written opinions that deny Christians various rights and he was responsible in part for the Roe vs Wade decision. His liberal agenda has done irreparable harm to Americans and especially the unborn. Dr. David Kelly, the weapons inspector who first queried the continued existence of Iraq's weapons of mass destruction was found slumped in his car. His death looked like it was suicide, and the coroner ruled the case as a suicide, however, there is a group of doctors who have been gathering evidence to show that this is not possible... that the artery that was slashed was too small for Kelly to have bled to death. I think it is possible to conclude that Iraq had WMDs. In fact Saddam Hussein used those weapons against his own people. He was ordered to destroy the weapons, and the weapons inspectors were supposed to go in and check to make sure that they had been destroyed. What seems to have taken place is that Saddam Hussein either got rid of the WMDs by sending them across the border into Syria, or he had destroyed them and then pretended that they still existed. When Saddam Hussein was captured he did admit that he had pretended to continue to have the weapons, as a protection against Iran... I can understand why he would have wanted to pretend to Iran that he had the weapons... as such I think that Saddam Hussein did in fact dupe the world about the existence of the weapons. He would not let the weapons inspectors into Iraq to check and make sure that the weapons had been destroyed. If Dr. Kelly's death was not a suicide after all, then what in fact happened? Was this a government hit? Having had the experience of a dog and cat that "slept together" and "ate together" well, what really happened is that the dog thought that she was mother to the kitten, I do like to read these animals stories. 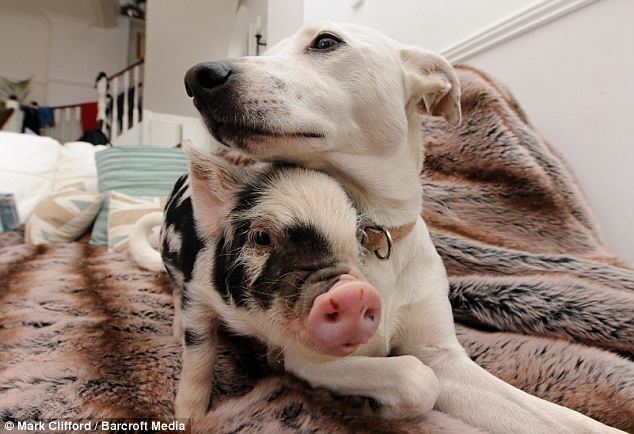 This one is no different because the dog, cat and micro pigs living together in harmony makes a great story.